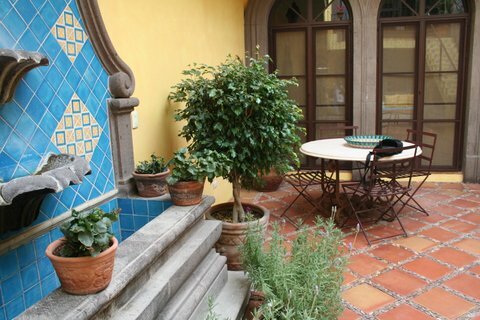 Casa Anna is a charming, recently renovated home in the center of San Miguel's vibrant historic district. After six months of construction our home is ready for your visit: all new baths, doors, windows, flooring, pressurized and purified water—everything that will make your vacation stay comfortable and memorable. Upon entry walk down a long, lantern‐studded front hallway to the first courtyard. Here you'll find a charming fountain and two sitting areas for taking your morning coffee or sitting out late into the evening. A first‐floor master suite with a large two‐person shower and arched French doors is located off this patio. 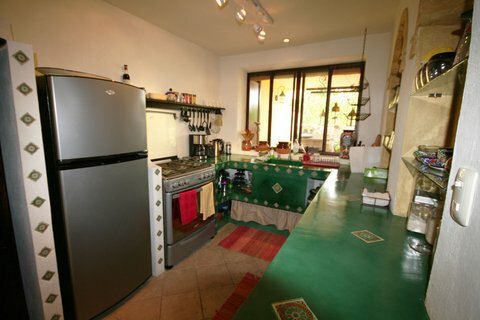 A door from the front patio leads into the den and eat-in kitchen. Or head out the back door to the second patio where there is a seven‐foot kitchen table for 10. and a charming rock‐wall fountain. The back patio reminds of us a Greek taverna with its beamed ceiling, greenery overhead, and cool shade. On the second floor of our three‐story home you'll find the grand sala with a floor‐to‐ceiling fireplace, and behind that a separate bar with pony-skin bar stools and chairs, a wine fridge, bar fridge, and all kinds of glassware and games for entertaining. Beyond the bar are two connected bedrooms and a shared bath. (See the bedrooms link for more details.) A laundry room and small maid's bedroom and bath are also located on the second floor, off a walkway that crosses above the patio. 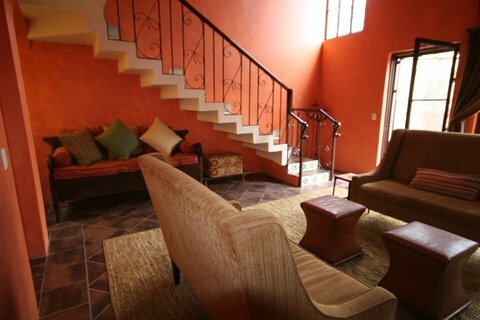 A stairway from the main sala leads to the third floor with its full‐floor suite. This spacious, light‐strewn floor has a master bedroom, bath, study, and outdoor terrace with marvelous views to the Belles Artes and Parroquoia. Arch leading from patio to entrance hall. The front patio. Photo taken from first-floor master bedroom. 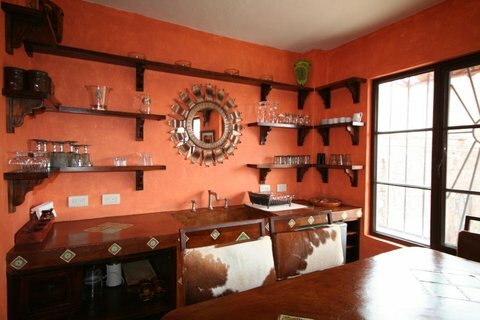 A bar in your own home—what a great way to spend an evening friends enjoying a game of Dudo, Scrabble, or liar's poker over a glass of scotch or a cold beer. 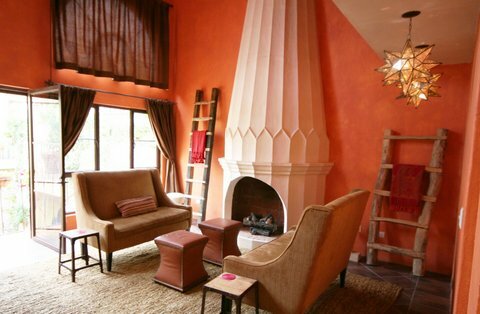 The adjoining grand sala has seating area for those guests who would rather sit out this round. 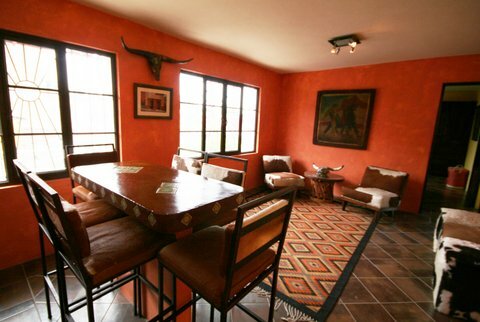 Light a fire, curl up with a book, and enjoy an evening at home in San Miguel. This bright, light-filled room is off the second-floor entrance. The bar and two bedrooms is behind it and the third-floor master suite is up the stairs. The very sunny main sala on the second floor. A lovely napping nook under the stairs that lead to the third floor master suite. View from the third floor down to the sala. A beautiful light in the grand sala. 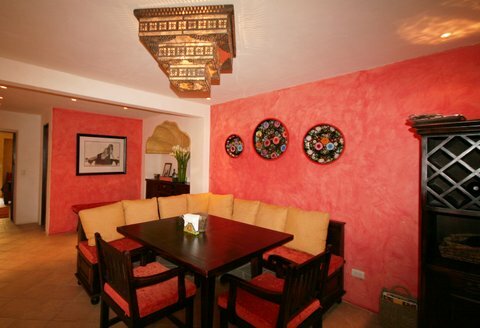 Sit down at kitchen banquette for memorable meals with friends and family. There's room for 8! A stylish powder room is off the kitchen. The first‐floor den has seating for four and is the perfect spot for a quiet read or an intimate conversation. There is a television in this room (the only one in the home) with American cable channels.